Your prescription for healthy billing! This is the Billing Department Costs plus the Software and Hardware costs. Please enter a value between 0.01 and 1.00. This is the total of actual collected claims. This is the total in collections minus the total cost. This is the total amount, in dollars, of claims collected from the above field. This is the total of claims actually collected. MOST billing companies charge a 6% fee for total collections. This is the total cost of outsourced medical billing which includes our annual enrollment fee and the 6% billing fee. 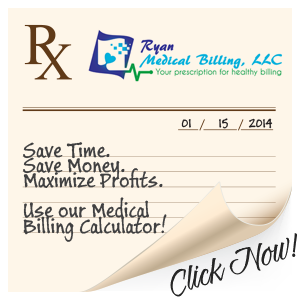 This is the total net for Outsourced Medical Billing through Ryan Medical Billing. This is the total net for your In-House Medical Billing Department from above as a comparison. Want a copy of the report? Email a copy of this report? Please know that these figures are an estimate. For more detail, please contact us today! Yes! Please email me a copy of this report!